Steele, Robert. 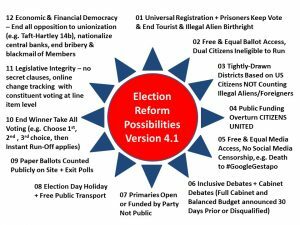 Reinventing the US Army Part I – An American Grand Strategy, Oakton, VA: Earth Intelligence Network, 2016. 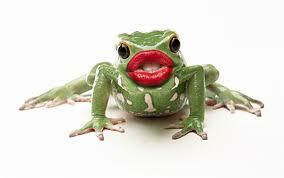 Free Online. Steele, Robert. Reinventing the US Army Part II – Overview of Planning and Programming Factors for Expeditionary Army Operations, Oakton, VA: Earth Intelligence Network, 2016. Free Online. Steele, Robert. Reinventing the US Army Part III – Strategy, Reality, Precepts, Structure, & Leadership, Oakton, VA: Earth Intelligence Network, 2016. Free Online. Steele, Robert. 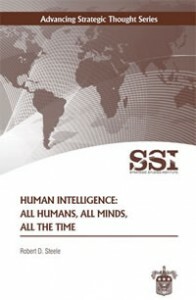 Human Intelligence: All Humans, All Minds, All the Time, Carlisle, PA: Strategic Studies Institute, U.S. Army War College, Press, June 3, 2010. The author explores the centrality of Human Intelligence in meeting the needs of the U.S. Army, as well as the Department of Defense, and the whole of government, for relevant information and tailored intelligence essential to creating a national security strategy; for defining whole of government policies that work in harmony; for acquisition of the right capabilities at the right price in time to be useful; and for operations, both local and global. 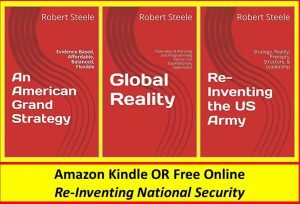 He outlines 15 distinct types of HUMINT, four of which are classified (defensive and offensive counterintelligence, clandestine operations, and covert action), with the other 11 being predominantly unclassified. 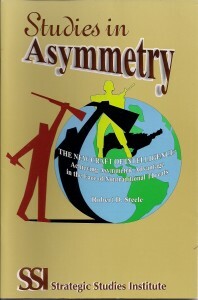 The author offers the U.S. Army an orientation to a world in which thinkers displace shooters as the center of gravity for planning, programming, and budgeting, as well as the proper structuring of mission mandates, force structures, and tactics and techniques to be used in any given mission area. Steele, Robert. 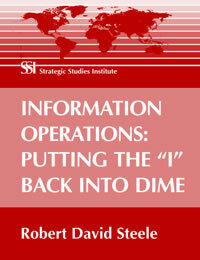 Information Operations: Putting the “I” Back Into DIME, Carlisle, PA: Strategic Studies Institute, U.S. Army War College, Press, February 1, 2006. In the past year, Information Operations (IO) has matured from an early emphasis on the protection of critical infrastructures and against electronic espionage and is now more focused on content and on interagency information-sharing. The value of information–all information, not only secret information–and the value of global monitoring in all languages, 24/7, has been clearly established by the Undersecretary of Defense for Intelligence (USDI). This monograph defines and discusses three IO elements: Strategic Communication (the message); Open Source Intelligence (the reality); and, Joint Information Operations Centers (the technology). It concludes with a strategic overview of the various conceptual and technical elements required to meet modern IO needs, and provides a requirements statement that could be tailored to the needs of any Combatant Commander, service, or agency. Steele, Robert. 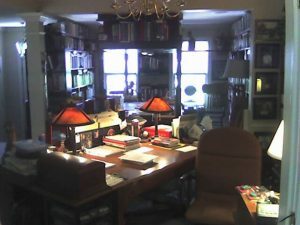 The New Craft of Intelligence: Achieving Asymmetric Advantage in the Face of Nontraditional Threats, Carlisle, PA: Strategic Studies Institute, U.S. Army War College, Press, February 1, 2002. This monograph is the third in the Strategic Studies Institute’s “Studies in Asymmetry” Series. 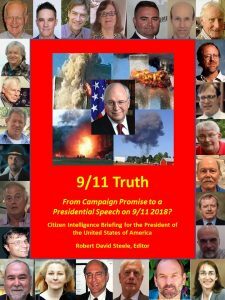 In it, the author examines two paradigm shifts–one in relation to the threat and a second in relation to intelligence methods– while offering a new model for threat analysis and a new model for intelligence operations in support to policy, acquisition, and command engaged in nontraditional asymmetric warfare. He concludes with an examination of the Revolution in Military Affairs and the need for a Revolution in Intelligence Affairs.